Nonni Guesthouse has a small bar. Full information on tours and attractions are available on site as is a booking service. Laundry services are also available nearby. 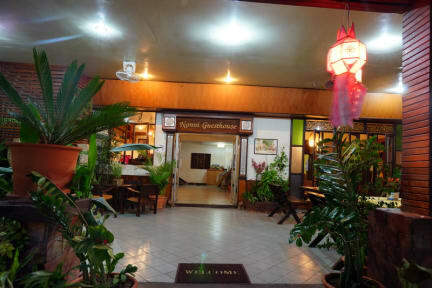 Nonni is located in the Wua Lai community, 3 minutes walk to the popular Saturday Walking Street and the Chiang Mai Gate entrance to the old city. Our immediate neighbourhood (ie within a few minutes walk) includes: several restaurants and a restaurant/bar(Thai, Dutch Italian, other European cuisine) two local markets, a French bakery, coffee garden, , cycle and scooter hire, convenience stores, and hospital. This is one of the best rated locations in Chiang Mai. Chiang Mai Airport is a 15 minute drive way. A total of 12 rooms. Four budget rooms (singles, twin, double) with two shared bathrooms. The remaining rooms, all with internal bathrooms, include single, double, twin, triple rooms, some with a balcony. 2. Cancellation policy: A 3-day advance notice is required for cancellation free of charge. 3. Check in from 12 noon and check out until 11am. 4.Reception is 7am to 7pm. Guests should contact us before booking if arriving outside of those hours. We may be able to provide a later check in. Great little guesthouse and the owner is always around to help you out if you need it. Our room was small but it was all perfect for what we needed and the location is great. Near the markets and Chang Mai Gate. Alan was very helpful right from the start, booked me and my girlfriend a VIP bus to Pai and recommended some good food around. I accidentally booked a single private room but he was very nice about it. Having a cool pub next door was also a plus! 5 minute walk from the old city and lots of cool street vendors. 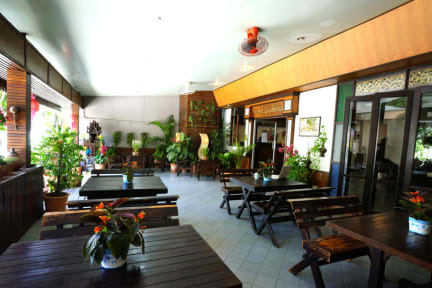 Great location right by Chiang Mai gate and the market, 15 min walk to the middle of the old city. Allan is super helpful and let us store some luggage when we went on an overnight trip. Facilities are a little older but kept clean and our room is a great value which included fridge and private bathroom. Recommend for thrifty travelers! Nonni guesthouse has clean rooms for a smaller budget. They are not super cozy but if you're just planning to have a good night sleep, then there is everything you need. The shower is hot, linen and towels clean. The location is nice, just around the old City and also The best daily nightmarket (concerning food). A/C worked fine and was a necessity during the hot season. Thanks for a nice stay! Nonni is a perfect place for anyone wanting a clean, quiet and affordable spot close to the Old City, but far enough away to avoid the chaos and noise. You are a less than 5 min walk to the south entrance of the Old City. The rooms are VERY clean and I have high standards for that. The building is older, but you have everything you need. The shared bathrooms could be a little cleaner, but it’s hard to keep up with so many people. Alan is a great host! Would stay again. Good value, decent room and bathroom. Clean. We only stayed for one night but it was very pleasant. The room was well equipped, we received a towel and a bar of soap each. The wifi was strong and the shower was hot. The owner and his dog were extremely friendly and helped make the stay rather pleasant. Would stay there again. Great host, good location, excellent security. Hotel is a bit dated. Lots of mosquitos when I was there, also many squished on the walls in the rooms and bathrooms. Dusty under bed, but linens crispy clean. Good value for money though. Good location, close to old town, room had everything we required a stop over stay. Allan was friendly and helpful.